Why do ceiling fans seem to attract dust? Doesn't the revolution of the fan blades kick off any dust that accumulates on them? Why should you make cleaning your interior fans a priority for your house cleaning efforts? With you and your air quality in mind, You've Got Maids wants you to take your green house cleaning seriously. That process begins and ends, in our opinion with the process of cleaning dust off of ceiling fans. For us, it is one of the most applicable though widely ignored cleaning tips. 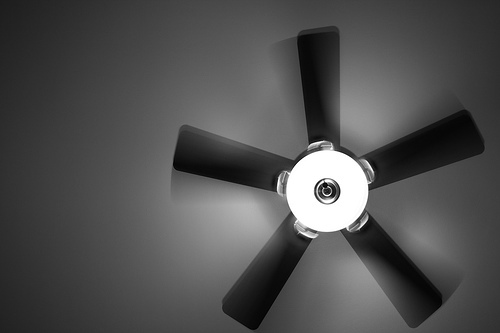 Blogger Loren Larson tackled the question for the web site Imponderables, in a blog post titled Why Do Ceiling Fans Get Dusty? You'd think that the constantly turning blades would throw off any incidental dust that accumulates on an interior fan, particularly the blades of ceiling fans, asserts Larson. But you'd be wrong. Ceiling fans seem to be dust magnets.